When the concept of Phase II was introduced, it was made clear that two affiliations/factions would be receiving the lion’s share of the material at a time. Not that the others would be left out in the cold, but it was clear that some groups would need to be more patient than others. With there being fifteen groups under this banner, anyone who could do the most basic of math would realize that by going two-by-two, someone would be left out in the cold. Sure enough, by the time everything is all said and done; The Klingons, Ferengi, and Original Series were all left out of the spotlight. At least in theory; make no mistake they have all gotten something in the intervening expansions. But in this first expansion going back to ‘normal,’ they each get at least two cards, one of which has Star Power. Not bad, huh? For instance, TOS fans get a Tuvok. Yes, he technically has the Voyager reportability icon, but his game text does allow for an appearance on TOS ships; and a welcome appearance he will make. He has the fairly rare Astrometrics skil, but he also has the even rarer Law. These are in very short supply and the Astrometrics goes in nicely with his Science. But he also has a home in a Voyager deck. He does have a bit of skill overlap with his previous versions, but there is more redundancy available. While he does bear the rare Law skill, he isn’t unique in that respect; the real gem is in his cost. He is cheaper than his other versions, but not short on the ubiquity of his usefulness. While his staff icon might not be all that amazing in a TOS deck, he gains much usefulness in a Voyager deck where staffing is much more necessary. 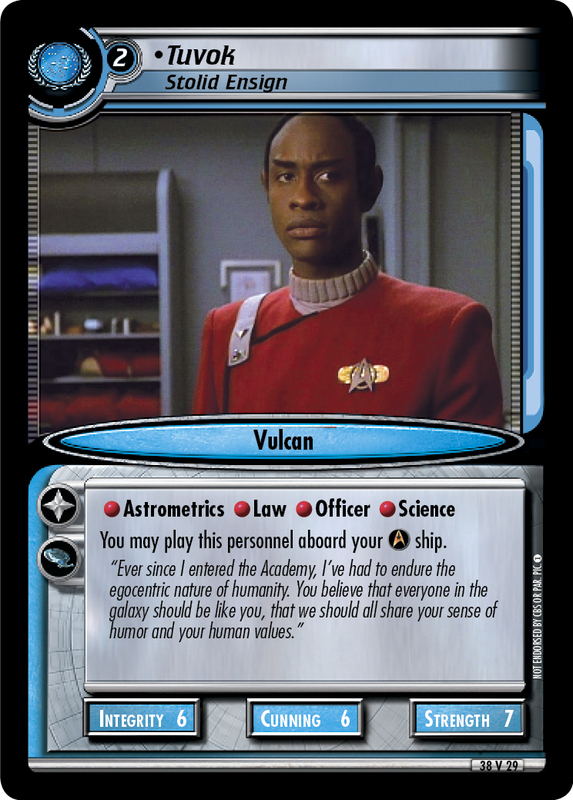 For that matter, the fellow to Tuvok’s right can be useful in multiple deck types as well. 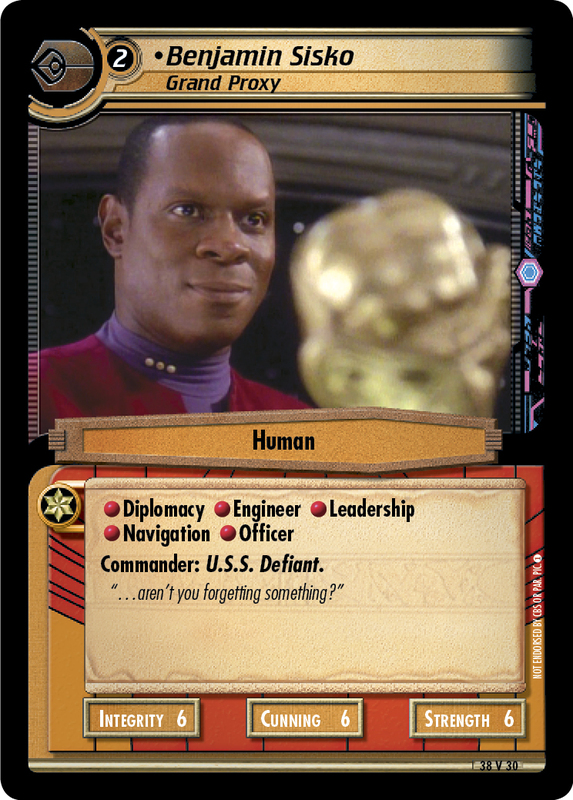 Benjamin Sisko was spoiled in the newsletter for the month of August and there hasn’t been a word about it on the forums, chat rooms, or bathroom stalls. I’m not sure why. First off, the obvious: Sisko offers a rare Diplomacy and short on supply Engineer. He is a skill horse and a bargain at two counters even not accounting for his command star. These are all very welcome to the Ferengi, and while they won’t be a clear way to smash through mission attempts, he is a great supplement to the deck. There is a lack of a DS9 icon, but that is fixable enough with the Multidimensional Transporter Device. You can do what our First Edition brethren call a 'persona swap' and gain a Federation Sisko with the appropriate icon. This is useful when you consider the already available personnel who bear that icon already. Suddenly putting in a few cards working off that icon doesn’t seem like a bad idea! Two new guys who are useful in multiple decks and mains to boot. Not too bad a reward for just a bit of patience.